So. This is not my original idea, just something we are using during our study of memoirs in Reader’s and Writer’s Workshop. 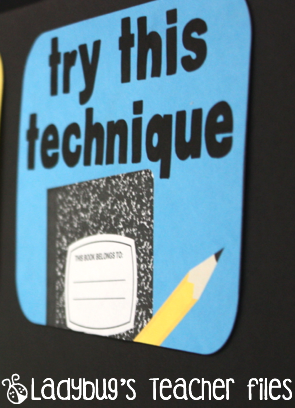 (I used some different phrasing on each poster than the original board I learned about…I wanted to incorporate the word “technique” as we studied various elements). As we read a book, we make observations of techniques used by the author (for instance, similes in Owl Moon). We then name the technique and discussed why it is used. We record the current book under “Used in These Books”, leaving space for future titles that have this same technique. 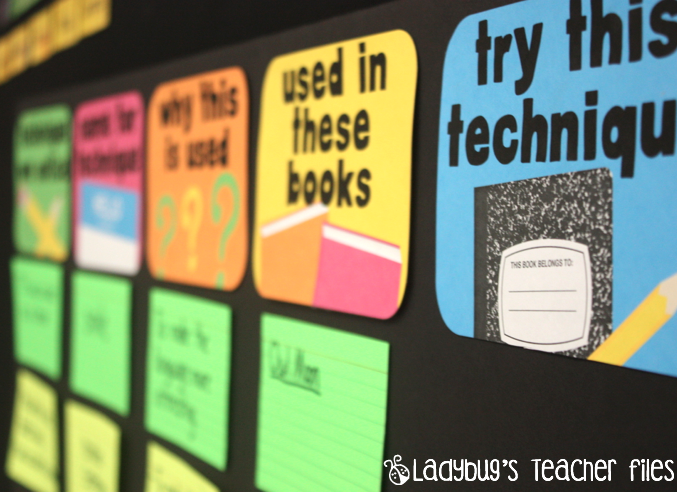 This part is left open for students’ names to be added (on sticky notes) when they have tried the technique. Again, not my original idea, but I know this is going to be so helpful for my class during our Writer’s Workshop! (black to set off the bright, but of course!). I decided to go with this board because, besides the fact I am running out of display space with all of our charts, I love how it’s portable and can be moved to the carpet during mini-lessons, or to groups of students when needed. If you would like to download a copy of this free file, please click on the image below. Please Note: This file is for personal use only…the posters are not meant to be recolored or altered in any way–thanks! Love them! Your designs are just so beautiful! I love your author's technique posters. They turned out amazing! So not teaching related, but I LOVE the ring! This is a great idea! I have a small bulletin board that this would fit great on! Thank you for sharing these! We just finished an author study of Patricia Polacco so we will be adding some of her techniques to this board right away. What a great way to help the kids improve their writing! I LOVE this! I just found out this week that I will be starting my student teaching come January! This is definitely going on my project list to put together before then! Thank you so much Kristen for always taking the time to share these wonderful ideas! I am packed and ready for my student teaching with so much information I have learned from you! This newbie so appreciates you!!! Love! I can't wait to make and display this board! You know my district has a few lessons like this in our writing curriculum but with different language obviously. 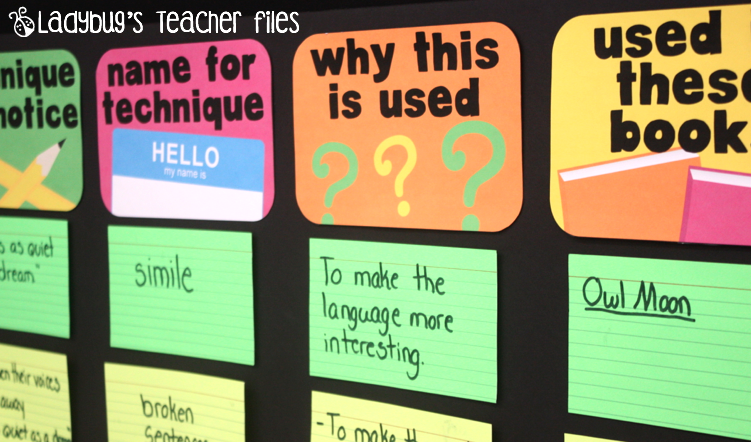 They make it an anchor chart and it is always kind of blah. This has so much pizzazz I love it. The only difference I would make would be to add a picture of the text/ front cover for my little kids that can't read. Love the portable board deal. I do some of that during the year with some of our theme stuff. It's wonderful to be able to move and tuck away if needed. Your so brilliant. 🙂 Miss chatting my friend. Hope to catch up with you soon. What a great idea! I do so many mini-lessons with Reading Workshop and am struggling to manage the cafe board. I feel like my kids don't use it either. This is so much easier, as it really puts it out there for kids to USE the strategies, since the transfer from lessons in reading barely show up in my kids' writing. Thanks so much for sharing! I love your style, Kristen! Everything you do is so PERFECT, Kristen! And two more comments…1) LOVE that ring in the picture;) 2) Your pictures are absolutely AMAZING…as always!